After Ira Baxter was diagnosed with prostate cancer in the fall of 2014, he tried just about everything to treat it. He had his prostate-specific antigen (PSA) levels tested and retested. He sought a second opinion, then a third—consulting physicians in Nashville, Los Angeles and Houston. For a time, he ate an all-organic diet, trying to eliminate sugar and carcinogens. He changed his deodorant and soap. Faced with a big decision—options included removing his prostate and risking serious side effects or spending years keeping an eye on the cancer and risking it spreading outside of the gland—Baxter turned to David Penson, M.D., MPH, director of the Center for Surgical Quality and Outcomes Research at Vanderbilt University Medical Center. “When I met him, it just clicked,” said Baxter, who was 62 years old at the time. A doctor before Penson had looked at Baxter’s cancer cells under a microscope and determined the severity (Gleason Score) was a six on a scale of two to 10. That made him a reasonable candidate for active surveillance, or close medical supervision of what may be a non-lethal, slow-growing cancer. But Penson, the Paul V. Hamilton M.D. and Virginia E. Howd Professor of Urologic Surgery and chair of the department, asked to do his own assessment of the Gleason score. Baxter agreed. “He was just very patient,” Baxter said. “He spent a long time with me. I think the first time we talked an hour. Baxter learned the results of Vanderbilt’s assessment during Spring Break in 2015. Penson and his family were at the beach, and he called Baxter. He told Baxter that further analysis showed his cancer was actually the more aggressive form of Gleason 7. Active surveillance of the cancer was no longer an option, Penson advised. Baxter could have the cancer removed or undergo radiation. Each option carried the significant risk of side effects such as incontinence and impotence. None of the above sounded good to Baxter. But he was having trouble doing his usual two-hour workouts with his stringent diet. “I was struggling on the amount of nutrition I was taking,” he said. A nutritionist he was seeing suggested he should drop endurance sports. But Baxter, a long-distance bicyclist, didn’t want to give up the sport he loved. Penson told him that advances in robotic surgery could minimize the side effects of surgery. He recommended doing an MRI fusion biopsy that uses a robotic arm to get more data on the tumor. The fusion technology available at Vanderbilt combines 3-D images with real-time ultrasound imaging, MRI and advanced robotic technology to achieve very accurate biopsies. The biopsy result revealed the tumor was still inside the prostate and confirmed the Gleason score of 7. Penson discussed the alternatives with Baxter in detail, and they decided that the robotic prostatectomy was the best option. Baxter’s screening eventually led to a successful surgery. He hasn’t suffered any incontinence, and he still has sexual function. 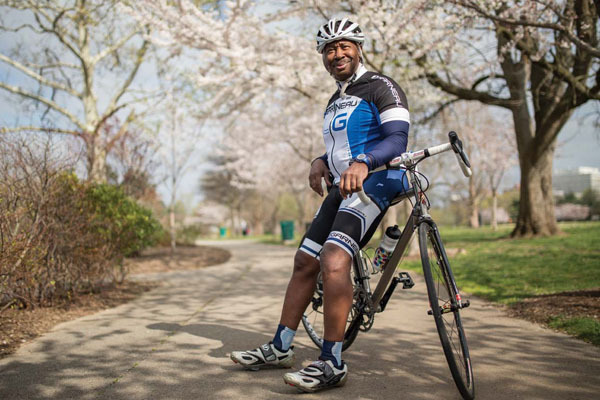 It went so well, he said, he was able to participate in a 65-mile cycling event in Atlanta eight weeks after surgery with no problems. Diagnosing and treating prostate cancer isn’t always an exact science. Having a doctor you trust and making a shared decision based on evidence is essential, Penson said. While some men are anxious to have any cancer removed, other men feel better about keeping a slower-growing cancer under active surveillance. One of them is Dan Miller, who was diagnosed with prostate cancer five years ago. His Gleason score was 6. His research led him from his doctor in Knoxville to a radiotherapy clinic in Atlanta. The more he studied, the more frustrating it got. “I was never really satisfied with anything because I got so much contradictory information,” he said. Ultimately, he scheduled an appointment with Penson, and settled on active surveillance. Though his first biopsy was positive, the next two weren’t. He said he doesn’t really think about prostate cancer anymore. Deciding between surgery and active surveillance is one of many ambiguities in the detection and treatment of prostate cancer. Another is deciding whether to have a PSA test at all, the subject of an editorial Penson published last year in the Journal of the American Medical Association. Penson wrote that PSA tests should remain an option. Two influential organizations—the U.S. Preventive Services Task Force (USPSTF) and the American Academy of Family Physicians—have begun to advise against PSA tests, saying the potential harm outweighs the potential benefit. Meanwhile, several other notable groups say men should consider PSA tests, including the American Cancer Society and the American Society of Clinical Oncology. The dilemma of to test or not to test is reflected in two often-discussed studies, which each have shortcomings. The National Cancer Society’s Prostate, Lung Cancer, Colorectal and Ovarian (PLCO) study failed to show a survival benefit for prostate screening. But, Penson said, it doesn’t truly compare men who are screened and those who weren’t; rather, it compares men who were screened a little versus a lot. Another contemporary study, the European Randomized Study of Screening for Prostate Cancer, shows a benefit for prostate screening, “but it’s not as big as we would like it to be,” Penson said. If the PSA reading or exam causes alarm, a biopsy can be made, which has a proven track record of detecting cancer at a stage early enough to be treated. “But the other thing we found is that it finds a lot of cancers that never needed to be treated, that had they been left on their own, the guys never would have had a problem with prostate cancer and would’ve ultimately had problems with other things and that would have done them in,” Penson said. In addition, other factors can raise PSA levels and digital rectal exams and biopsies are uncomfortable. Men suffer stress and anxiety waiting and considering test results, and prostate surgeries can lead to lifelong side effects such as incontinence and sexual dysfunction. Penson advocates for PSA tests to remain an option for prostate screening, while admitting their limitations. Looking back at his experience, Baxter favors PSA tests. His earlier PSA tests gave him a baseline for comparison for future ones, he said. Now 50 years old himself, Penson is facing the same situation he has guided his patients through. Sometime, in the next five years, he will be screened for prostate cancer. And he will get a PSA test. With cancer behind him, Baxter has become an advocate for prostate cancer screenings. He’s leading a prostate cancer support group and is starting one at his church. His advocacy includes recommending PSA tests.